Psychological Skills for Professional Services Ltd | Is the definition of Partner “No more development required”? ‘Negative stigma’ is an interesting choice of phrase and hints at the strength of feeling held by many in the Partner group towards performance management. It also intimates the principal ambition of many Partners: ensuring they meet their contribution targets, usually billable hours or utilisation. A ‘stigma’ is defined as: “a strong feeling of disapproval that most people in a society have about something, especially when this is unfair” and its synonyms include shame, disgrace and dishonour. Why is performance management (or contribution management) held in such low regard by Partners? In our view, it stems from one of the primary characteristics of Partner groups previously identified by Laura Empson: Extensive Individual Autonomy and the continued focus on short-term, financial, activity-driven targets. Crucially, the low value placed on performance management also implies a low value on a Partner’s individual development because personal development plans are often a key output of any performance management conversation. Above all, it could be inferred that once you make Partner, performance management – and any potential personal development – aren’t something you need to, or have time to worry about. While many firms undertake training programmes for their managers and have their own variation of a Partner ‘academy’ for their future Partners, once individuals reach the level of Partner, future development appears sporadic at best. Partners in professional services firms need and expect autonomy. They expect to be able to make their own decisions about how to apply their knowledge and expertise and manage their client relationships. The result of extensive individual autonomy is that Partners don’t like to, or expect to have their performance managed or challenged. It could also be suggested that those responsible for managing performance are reticent to undertake performance management conversations for fear that the Partner in question might take their proprietary client relationships elsewhere. This is backed up by the report which suggests that rather than holding formal, structured reviews which might question Partners’ autonomy in some way, conversations usually take the form of impromptu catch ups or as the report describes them “fireside chats”. It would be unfair to suggest that it is simply an attitude problem that inhibits performance management and subsequent development activities. The firm’s performance metrics have a significant role to play. 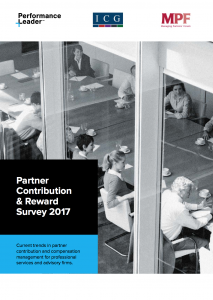 Once you make Partner, in most firms, the only metrics that matter are your annual contribution targets. We have previously written about the negative signals that an ongoing focus of performance management on short-term, financial metrics send to the firm’s clients and employees but there can also be little doubt on the impact these metrics have on a Partner’s motivation – and time – to undertake personal development. This is backed up by the research that finds that rather than ongoing regular reviews, most firms only undertake annual formal reviews with an emphasis on the past – whether financial targets have been met – rather than future objectives. As long as performance continues to be judged on activity-driven, financial metrics (utilisation/hours billed) and rewarded accordingly, Partners will have little time or inclination to undertake professional development activities and will prioritise short-term objectives over development activities that might not yield results until some time in the future. In our own recent experience, we have often found it is becoming ever harder for Partners to justify taking the ‘non-chargeable’ time to attend a development programme, despite the long-term benefits for the firm. Perhaps the definition of Partner: “No more development required” is close to the truth after all?